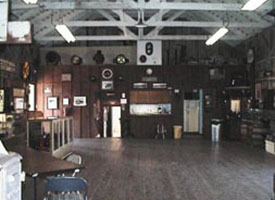 The Freight House Meeting Room is a medium sized room decorated with various railroad artifacts including hand lanterns and signal lights, historic pictures, and displays of memorabilia from former railroad employees. A kitchenette that includes a microwave oven, 2 sinks with hot water, an industrial grade drip coffee maker with multiple pot warming plates, a refrigerator, a telephone, and 10′+ of counter space. The usable floor space is approximately 30′x40′ (not including the kitchen) with a capacity of 100 standing, 83 seated in chairs, and 45 seated at tables. There are approximately 75 cushioned folding chairs and 6 2-1/2′x6′ folding tables available. A large 5′x9′ projection screen. CD Music and public address system with wireless microphones. 64″ color TV with a DVD/VCR. Access to two modern unisex restrooms. 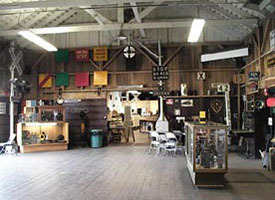 Some of the the artifact displays can be moved or removed by the SBHRS if needed to accommodate your needs.